A Livingskin™ prosthesis is designed to be unnoticed. Livingskin devices are hand-crafted from high definition silicone and hand-painted to match skin tone and appearance. Livingskin designs prostheses for clients with finger, hand, arm, as well as toe and foot deficiencies. Every prosthesis is custom painted to match the features which are unique to each client. With livingskin, clients receive the most realistic, aesthetic, and functional passive restoration available. 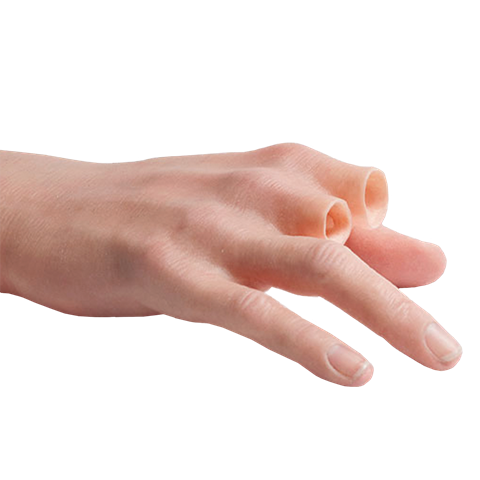 Hand crafted from high definition silicone and hand painted to match skin tone and appearance, our Livingskin™ prostheses are very realistic. We take care to ensure that the detail of these prostheses is remarkable, introducing features such as freckles and hair. In addition to the realistic appearance of our Livingskin™ products, it is important to remember that passive prostheses like these still have important functional capabilities. This includes actions such as pushing, pulling, stabilizing, supporting, light grasping and typing.